Every year, millions of homeowners replace their roof, either because it has reached the end of its lifespan or the last storm really did a number on it. But even though everyone eventually needs to replace their roof, there are several maintenance tips for shingle roofs you can use to avoid tearing it off sooner rather than later. 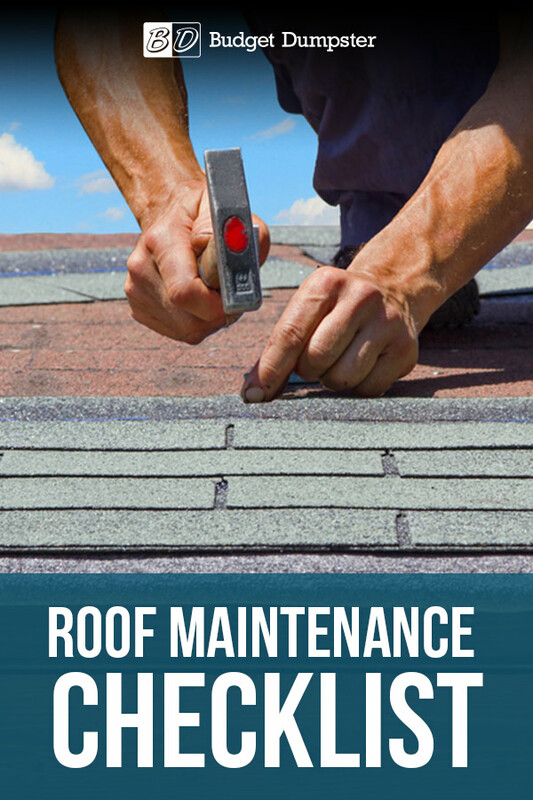 We’ve put together a quick-hitting roof maintenance checklist that will help you identify and prevent the kind of damage that spells doom for your average roof. Any of the above signs of damage should be looked at as soon as possible, preferably by a professional roofing contractor who can safely make the necessary repairs. Wondering why you should pay for a roofing inspection when you have our roof maintenance checklist right in front of you? 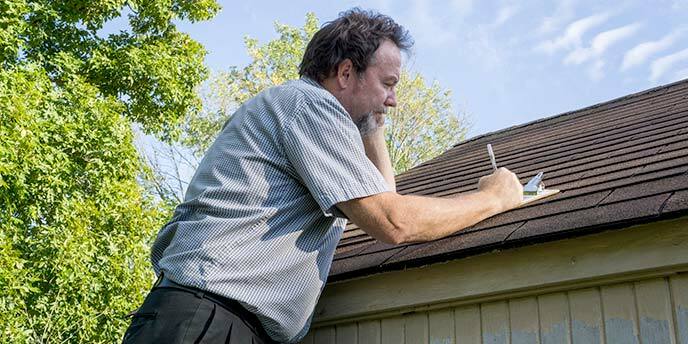 An inspector will be able to spot potential problems you might’ve missed, as well as provide you with invaluable tips for maintaining your roof. They’ll also give you a rough idea of how many more years it will last. Most roofers recommend inspections every two years, but an inspection once a year will increase your chances of finding potential issues before they become costly repairs. Roof inspections can vary in price from $250 to $650 on the high end. But the cost of hiring a roof inspector is much lower than the cost to replace your roof. Use the The American Society of Home Inspectors or the International Association of Certified Home Inspectors to find a reputable inspector near you. Their members are prohibited from offering to make their own recommended repairs, ensuring you receive a fair price and an honest opinion. Musty odors in certain rooms. Spots on your exterior walls. Bulging patches on your interior walls. If you notice any of these signs, your next step is to locate the leak and call in a professional to patch up the hole in your roof. 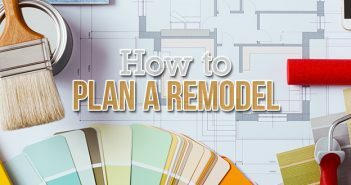 Though if you’re comfortable working on your home yourself, there are a couple of DIY repairs in the post below you may consider. A key piece of advice when it comes to maintaining a shingle roof is to wash it. At some point, your roof will start to look dirty, with long, dark streaks flowing from peak to eave. This is algae growing on your house. Algae won’t cause any immediate damage, but if you leave it long enough it can slowly rot your shingles. To get rid of these little plant-like critters, spray your roof with a 50 percent mix of water and bleach. The bleach will kill the algae fairly quickly, but you’ll also want to install copper strips just beneath your roof’s peak. When it rains, the copper molecules will stream down your roof, killing any algae fixing for a comeback. 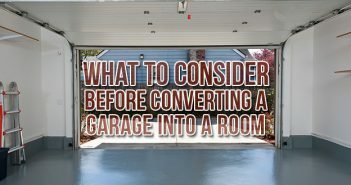 No roof maintenance checklist would be complete without this tip. 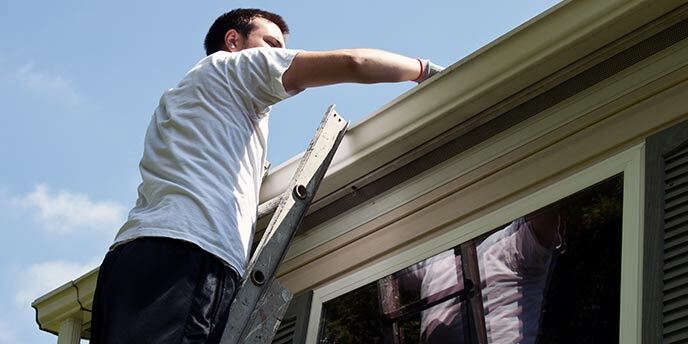 Though it’s a dirty job, cleaning out your gutters is an essential part of maintaining your roof. Clogged gutters make it easy for water to seep under the structure of your roof, creating more than just a few water stains. Most experts recommend cleaning them out twice a year, once in late spring and again in early fall, as part of a regular fall home maintenance checklist. Tree branches can be a problem for a few reasons, the most obvious being the risk of them falling on your roof during severe weather. Be vigilant when it comes to your landscaping and cut off any large branches that are directly over your roof. This will help reduce storm damage, while also preventing leaves from piling on top of your shingles, absorbing moisture and eventually rotting your roof. While running through your roof maintenance checklist, make sure you check out your chimney for cracks or missing mortar. Structural damage of any size can cause bricks to start falling out, which can damage your roof, let alone cause your chimney to collapse. You can either hire a contractor to patch up any mortar cracks, or break out a trowel and do it yourself. A sloping or leaning chimney can be caused by issues with your home’s foundation as well. If you notice your chimney has moved, call a contractor to have it fixed right away and check the rest of your home for signs of foundation problems. Important Roof Maintenance Tip: Always have a spotter when you’re working on a ladder. If you’re working on the roof itself, invest in a safety harness to avoid serious injuries. Better still, have a professional roofer take care of the repairs. What Should I Do When It’s Time to Replace My Roof? With our checklist of roof maintenance tips, and a good pair of binoculars, you’ll have everything you need to keep your roof in good repair for years to come. And if you do need to get rid of some roofing debris, there are plenty of quick and convenient disposal options for shingles. Have a few other projects you’re hoping to knock out soon? 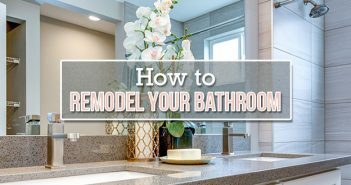 Check out our Home Improvement & DIY section for more home maintenance tips.